Amazing speedball block printing set in the water soluble formula. 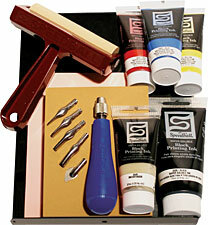 The Speedball block printing kit is designed for the true block printing enthusiast! Kit includes one each of the following: 4" x 5" lino block, 4" x 6" Speedy Stamp, lino handle, #1 cutter, #2 cutter, #3 cutter, #5 cutter, #6 knife, 75cc water soluble block printing ink (black), 37cc water soluble block printing ink in three colors (red, blue, yellow), 37cc water soluble block printing extender (designed to create transparent color), 4" soft pop-in brayer, dual purpose bench hook/inking plate, Block Printing Tips and Idea booklet. Starvin' Artist is an amazing custom picture framer that is also an art supply store in the Chicago area.